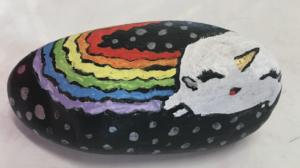 Inspired by an Elementary School from Indiana in the US, The Alexandra Primary School Year 7/8 Sticks ‘n Stones Ambassador Team took Linda Kranz’s Only One You picture book with its stunning rock fish illustrations and wanted to celebrate the individuality of all of the students in the school through a collaborative project. Only One You is an inspirational children’s book about Adri, a little fish who is about to go explore the ocean on his own. His mother and father tell him some of the important lessons they’ve learned throughout their lives in hopes that it will help him on his journey. The book emphasises how everyone is unique, and that each of us have something to contribute to the world. This message was the inspiration for taking the excitement and momentum generated from Pink Shirt Day and involving the whole school in thinking about how everyone plays a part in making space for everyone to be themselves and to be accepted and respected for who they are. Motivated by Year 7/8 Teacher & Team leader Tiffany Kemp and supported at every stage by Learning Coach Corrie Barrett, this was an intense project that took many months and a commitment from a wide range of ambassadors. A number of designs were suggested and then voted on by the team to create a permanent celebration of their learning as ambassadors. The final design was to create a ocean scene with 3D fish made up of all of the individual Rockfish showing that though we are all individuals with unique qualities and strengths, together we create our ‘school’. We also wanted additional rocks with key qualities important to us and to APS. After reading the book and thinking about what messages they took away that they wanted to emphasise, several students volunteered to visit the other classes to share the book and discuss the take away messages. The Principal was approached with a plan and a vision to approve so the project could take shape. Others then supported younger students to paint their own rock fish that represented who they were and what made them special. Jenna Airey took the lead to approach local businesses for support with donating materials and our main sponsor Mitre 10 enthusiastically came on board, providing us with donations and discounted materials. 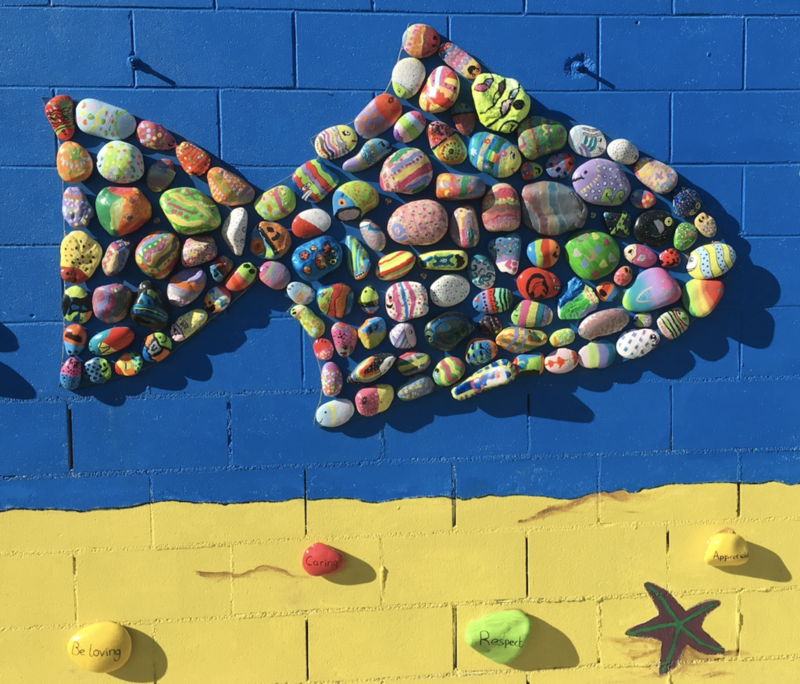 Colour Plus and Resene in Alexandra also generously donated paint for the rock fish to be created by every student. The final product has led to a lot of excitement from the younger students who are incredibly proud when they spot their rockfish in the final design, parents have given a lot of positive comments and the Ambassadors feel really proud to have taken an idea, inspired by a wonderful book to celebrate their learning and the change they want to see in the world.